Use “Control F” to quickly search for a soldier in the list below. William was born in Salem, Massachusetts on September 1, 1897. He was drafted in June of 1918. John was born in County Antrim on March 11, 1879. In August 1917, in Lens, France, John was gassed as he was going over the top before he was able to put on his mask. The next day he was buried alive by a shell explosion, but sustained only a minor concussion. He was discharged in June 1918 because of bronchitis (caused by the gassing). John and his wife Mary Ann settled in Dimsdale in 1919. The couple had three sons and two daughters. Thomas was born in Lindsay, Ontario on September 1, 1892. He homesteaded at 26-72-10-W6 and enlisted in the Canadian army on March 26, 1916. Thomas received a gunshot wound to his right hand on October 30, 1917 at Passchendaele and was sent back to Canada in September of 1918, medically unfit because of his wound. Thomas died on October 31, 1953. Alfred was born in Grouard, Alberta on July 11, 1897. He was drafted into the Canadian army March of 1918, but went absent without leave. In June, Alfred re-enlisted. John was born in Marown on the Isle of Man on February 27, 1883. He and his wife Gertrude Kate came to Canada in 1908; John filed on a homestead at NE 36-73-5-W6 in 1915. In March of 1916, John enlisted in the Canadian army, but he was discharged on November 7 of that year because of a tumor on his inner right knee. Gertrude died on August 2, 1941; John was later remarried to Martha Gudlaugson on April 27, 1943. The couple eventually moved to Vancouver Island, where John died in March of 1968. Richard was born in Plymouth, England on August 2, 1881. It is unknown when he came to Canada, but he enlisted in Calgary on November 16, 1914. Richard suffered from shell shock due to an explosion at St. Eloi on June 4, 1916. On December 4, 1916, he was invalided to Canada. Also in December, Richard was granted permission to marry Alice. Richard was discharged, having been found medically unfit, on August 31, 1917. He was commended for wanting to carry on with work, despite tiring easily and not eating or sleeping well, according to a report dated May of 1917. On March 28, 1918, Richard was drafted into the Canadian Army. He filed on homesteads at NW 32-78-20-W5 and NE 31-78-20-W5 in 1918. Alexander "Sandy" Cameron was born on March 28, 1879 in Strontian, Argyll, Scotland. He came to Canada in the early 1900s with his brother Donald. They worked several years in Manitoba before coming to the Peace Country and filing on homesteads in 1912. After the war Sandy and Donald ran a stopping place for travelers on the Edson Trail. They also ran the only feed grinding outfit in the area from 1919 until 1929. Sandy went to Edmonton in 1954 to seek treatment for corns on his feet and no trace of him has ever been found. Charles was born in Three Rivers, Quebec. He joined the Canadian armed forces in 1914, passing himself off as 18 though he was only 16 at the time (his attestation paper says his date of birth was January 2, 1896). Charlie married Clara on April 25, 1929 and because his nerves were bad due to his war experiences, the couple came west (along with Charles's brother Gordon, who also served in the war) and eventually settled in Bonanza. They had two children, Dave and Dorothy. Charlie died in 1961. Gordon was born in Montreal on January 3, 1895. Gordon came to the Peace country in 1913 and filed on a homestead near Beaverlodge. In 1917 he was drafted into the Canadian army, though he never saw active service. He returned to his homestead after the war and was able to increase his land with his Soldier Grant. Gordon never married and died in February 1974. He was buried in the Lake Saskatoon cemetery. Gordon was born in Three Rivers, Quebec on January 24, 1898 (according to his attestation paper; RCMPGraves.com gives his birthdate as 1900). He lied about his age to enlist in 1916 but was found out before he shipped overseas. In June 1918 he enlisted a second time, though once again he never made it overseas and was discharged in August 1919. It was at this time that Gordon joined the RNWMP. He met his wife Martha while serving in the Yukon, and had to leave the force to marry her. Gordon went into business with his brother Charlie and in 1929, both brothers came west to the Peace country. After their daughter Ione was born, Gordon and Martha decided there was no future for them in farming and they moved to Vancouver in 1934. Eventually they ended up in the Yukon, where George died on April 29, 1996. Frank was born on December 13, 1887 in Cardigan, Prince Edward Island. In 1914, he filed on a homestead in the North Kleskun district (SE 16-74-4-W6). Frank was drafted in 1918 and never saw action. After the war, he returned to PEI and married Mary on August 20, 1919. The couple returned to Alberta and settled on Frank's quarter section. Because of ill health it became necessary for Frank to give up farming, and he went to Drumheller in 1942 to work for the CNR as a bridgeman. The rest of the family joined him later the same year. Frank died on August 5, 1957 and is buried in Drumheller. Jack was born in Cookstown, Ontario on February 10, 1897. In about 1915, he went in search of new opportunities in Manitoba and later joined the Canadian army. Jack came to Alberta in 1919 with the other veterans and homesteaded at W1/2 15-80-8 W6 in the Blueberry Mountain district. He married Alice in 1923 when she had come to Canada on holiday to visit a friend. The Campbells stayed in Blueberry Mountain and farmed until Jack died on May 7, 1957. Joseph was born on October 20, 1889 in Fall River, Massachusetts. He spent a holiday in Athabasca Landing with a relative and decided to stay. In 1915, Alphonse joined the armed forces and went overseas. His service record indicates that he went AWOL from Witley Camp for about a month in August/September 1919. After the war, Alphonse returned to Athabasca with his bride, Jeanne Juliette de Chatillon from Nancy, France, but they moved on to Falher in 1921. The couple had no children of their own, but they adopted a son and daughter. In 1937, their home caught fire and Jeanne died when running in to search for something important. Alphonse was also burned and spent considerable time in the hospital. Alphonse died on March 3, 1970. Edward was born on October 9, 1888 in Springview, Keya Paha County, Nebraska. He came to the Peace Country and homesteaded at 35-72-6-W6. Edward married Alice Parenteau in Grande Prairie on March 15, 1915, though at the time of his enlistment, Alice's current address was listed as St. Julien, Saskatchewan. Edward enlisted on June 30, 1916 and deserted on September 19, 1916 before his unit sailed. David was born in Grouard, Alberta on August 15, 1892. He joined the Canadian in army in 1915 and served in France during the war. David was wounded in action twice; a shrapnel wound to his left knee in September of 1916 and a gunshot wound to his right shoulder in August 1918. He received the Distinguished Conduct Medal for gallantry and distinguished service in the field. His brother Edwin also served overseas. Edwin was born in March 1895 in Grouard, Alberta. He joined the Canadian armed forces in 1916, a year after his brother David. Edwin was wounded in action twice - a gunshot wound in the chest in May of 1917, and gunshot wounds to his left thigh and finger in October 1918. Victor was born in Belgium in 1892. In 1925, he took a homestead in Girouxville (NW 01-77-22-5). He later married Yvonne Allard and they lived on NW 12-78-22-5 until 1968. Sources: Reflexions Girouxville-Culp Vol. 1 p. 51 & Vol. 2 p. 406. Dr. Andrew Murray Carlisle was born in Peterborough, Ontario on March 6, 1896. He began medical training in 1913 but his studies were interrupted by the war. Murray enlisted while in his second year in 1915 and became a stretcher bearer in the Second Division Canadian Army. While there he attained the rank of sergeant in the Canadian Army Medical Corps and served in Canada, England, and France. After being discharged in 1918, Murray returned to complete his medical training. In 1921 Murray received a telegram from his brother-in-law Joe (Jack?) Archer in Lake Saskatoon, urgently requesting him to come north since the present doctor had left. In the summer of 1921, Murray met Jean McFarlane. Jean and Murray married in 1923. The doctor’s office was in their home and Jean wore many hats, serving as a nursing assistant and meal provider for out of town patients who had traveled far. The Carlisles briefly left the area when Murray was accepted to an internship at the Sick Children’s Hospital in Toronto, but returned to Wembley in 1926, which was where their three children Jim, Mary Jean, and David were born. As Dr. Carlisle had to travel to Grande Prairie nearly every day, the family eventually moved and built a new home across from Montrose School. Dr. Carlisle continued to practicing in Grande Prairie for the next 21 years. In 1957, the Carlisles retired to Victoria. Their children also moved away from Grande Prairie. Dr. Carlisle died in 1981 and Jean in 1986. Hugh was born in Pembroke, Ontario ca. 1882. He served in the Boer War and afterward traveled to New Zealand, where he met and married his wife Florence. They came west to Hythe in 1914 with Hugh's brother Percy and uncle Frank Biggs. Hugh was an engineer during the First World War, and also went overseas during the Second World War to serve as Home Guard soldier in England. Hugh died in Hythe in July of 1959. Edward was born in London, England on November 23, 1888. He immigrated to Canada in 1910 and worked in Toronto before homesteading at NW 4-74-7 near Buffalo Lakes. In 1915 Ed joined the Canadian armed forces and served overseas. He received a gunshot wound in his left arm at Vimy Ridge on April 12, 1917. At that point he had been in France for nine months. Ed spent eight months in hospital then was sent home in February 1918 because of a partial loss of function in his left arm. He was married in July of 1918. In 1939, Ed was called up under G.O. 139 and employed to train troops during the Second World War. Ed died in November 1975. Arthur was born in St. Scholastique, Quebec on March 12, 1887. He joined the Canadian army in October 1915. On August 28, 1918, during an attack east of Arras, he received a gunshot wound to the head. Arthur's comrades tended his wounds and carried him to the dressing station. He was later evacuated to No. 26 General Hospital, Etaples. Arthur died four days later on September 1, 1918 and was buried at Etaples Military Cemetery in France. George was born in Birmingham, Warwickshire, England on May 14, 1877. He filed on a homestead at 20-75-2-W6. George enlisted in the Canadian army on January 25, 1915 in Edmonton. He had previously served with The King’s Royal Rifle Corps (Regimental #7797) and had seen service in South Africa. George received shrapnel wounds to his left wrist, and was discharged in November of 1918 because of myalgia, caused by 'exposure' at Ypres in May of 1916. He died on March 14, 1961, and was buried in the Grande Prairie Cemetery. Walter was born in Edmonton on December 1, 1893. He filed on a homestead at 8-74-5-W6, north of Sexsmith. In September of 1914, Walter traveled to Valcartier to enlist in the Canadian army; he served both with the Lord Strathcona's Horse and the Royal Flying Corps. On March 22, 1918 Walter was killed in an airplane accident at Yatesbury, England. Gerald was born in Leskard, Ontario on September 16, 1897. He was the son of Arthur William and Elizabeth Carveth. His father and two brothers, Cecil and Rupert, arrived in the Grande Prairie area in 1911. His father returned east the following year to bring Gerald, his mother, and his sister Rita to join them. The family homesteaded on NW, NE, SE 10-72-5-W6. In September 1915, Gerald filed on his own homestead, SW 6-73-4-W6. He was drafted into the army in June 1918 and went overseas, though he remained in England and never saw active duty at the front lines in France. Gerald married Gladys Clarkson on February 14, 1923. They bought the Arthur Carveth farm, where they lived for 31 years. Three children were born to the Carveths - Jim, Betty, and Edna. Gerald died on April 13, 1982 in Grande Prairie at the age of 84. Clifford was born in Cobden, Ontario on December 30, 1892. He owned a homestead at SE 13-79-5-W6. In June of 1916, Clifford enlisted in the Canadian army. At this time he was unmarried, though in his will (dated October 3, 1916) he listed Rita Marie Harrington as his heir. As of the time of his death, the couple had married. Clifford died on December 1, 1918 of influenza at the No. 1 British Casualty Clearing Station. George was born in Hull, England on August 26, 1892. He came to the region in February 1912 and settled on a homestead near Bezanson. In 1915, George left his homestead and enlisted in the army. While fighting in France in September of 1916, a bullet grazed his head. At first he only experienced slight paralysis in his left hand and the left side of his face, but in June 1917, he was sent back to Canada because of epilepsy. In 1921, George married Anna Marie Peerenboom. From 1919 until 1930, George worked in the Grande Prairie Land Office. In 1930, he was transferred to Peace River until 1933. After a short residence in Grande Prairie, the family moved to Victoria. Philip was born in Liverpool, England on May 16, 1897. He came to Canada with his parents and two brothers in 1906 and settled in Saskatoon. Philip served in the Navy for four years during World War I. In 1927 he was offered a position as manager of the United Grain Growers elevator in Grande Prairie, commencing May 1. On April 17 of that same year, Philip married Violet Pangford. The Castles lived in Grande Prairie until 1928, at which time they moved to Beaverlodge to open the new Alberta Wheat Pool elevator. In 1936 Philip was promoted to elevator supervisor and transferred to Edmonton. They lived there for a year, then moved to Vermilion, which was the center of Philip's assigned territory. On September 16, 1943, Philip was injured in a fall while inspecting grain in the annex of an elevator. He died a few hours later. Christopher was born in Oxford, England on July 13, 1896. He was living in St. James, Manitoba as of the time of his enlistment in May of 1915. Christopher received shrapnel wounds to his right thigh and left arm at the Somme in 1916. In December of 1917, he was discharged as his heart trouble had left him medically unfit. He came to the South Peace, possibly in the 1920s or 1930s, and eventually moved into Grande Prairie. Christopher died on February 14, 1975 and was buried in the Grande Prairie cemetery. Arthur was born in Rathwell, Manitoba on January 9, 1898 (it is likely that he was in fact born in 1899 or 1900 and lied about his age). He enlisted in the Canadian army in 1916. In 1929, Arthur and his wife Belle came to the Hythe area and filed on a homestead at 14-73-12-W6. Arthur died on April 25, 1960 at the age of sixty. Albert was born on April 2, 1897 in St. Felix de Kingsey, Quebec. He filed on a homestead at SE 26-78-21-W5 and was living in Falher when he was drafted into the army. Albert remained single all his life and died in McLennan on June 27, 1959. He was buried in Donnelly. Armand was born in St. Liboire, Quebec on February 28, 1898. He was living in Pawtucket, Rhode Island with his father and working as a mill hand when he enlisted in June of 1918. Armand served only in England, and was discharged from the army on September 23, 1919. In 1929, he filed on a homestead at NE-31-78-24-W5. Lucien was born on Allumette Island, Quebec on October 17, 1895. He was drafted in June of 1918, while still living in Quebec, and never made it overseas. However, during the Second World War Lucien served in the Eaglesham and District Veterans Volunteer Reserve. Robert was born in Maysville, Kentucky on February 25, 1883. He was working as an electrician in Vancouver when he enlisted in November of 1916. Robert was a widower and had no children. Several times during his military career, Robert had forfeit pay. In July of 1917, he forfeited a day's pay for "not wearing a steel helmet in the Ypres Tower area." In November 1917, Robert was absent without leave for a day and a half and consequently forfeited a week's pay. Then on July 7, 1918 he appeared on parade unshaven and forfeited two days' pay. After being discharged in 1919, Robert came to the South Peace and filed on NE 31-69-23-W5 and SW 5-70-23-W5. Joseph Cyprien Choquet was born in Varennes, Quebec on November 6, 1889. He married Alma Cadieux in Montreal and in 1929 they moved to Teepee Creek, Alberta. They moved to British Columbia in 1961. Cyprien died on September 30, 1968. Leandre was born in Varennes, Quebec on September 28, 1885. He enlisted in the Canadian Army in October of 1914 in Montreal. In October of 1916, during the Battle of the Somme, Leandre received gunshot wounds to his left thigh. He was discharged on September 3, 1918, having been found medically unfit. In 1919, Leandre filed on the eastern half of 3-74-3-W6. Leandre died on April 10, 1960. Bill was born in Avoca, Iowa on November 22, 1897. His family moved to Nampa in 1898. At 16, Bill moved to McLennan and worked on the ED&BC Railroad. He enlisted in the army in 1917, but was discharged just days after enlistment because of flat feet. Bill served in the navy, working on minesweepers off the east coast. In 1918 he married Winnifred Haughn in Nova Scotia and the couple returned to McLennan. Bill worked first as a fireman for the railway, then as an engineer. He also worked as a recruiting advisor and the leader of the Veteran's Volunteer Reserve in McLennan during the Second World War. After the war, the Christians moved to Edmonton. They lived there until 1963, at which time they moved to Delta, BC. In May of 1978, they moved to Calgary and Bill died in September of that year. Joe was born in England around 1891. He served in the Navy during the war and came to Canada after the war with his wife Florence and their young daughter Doris (born 1913). The Churcher family settled near Hythe, where they lived until 1948. At that time they moved to British Columbia to be nearer Doris, who had married by that time. Joe died in Victoria, BC in fall of 1971. Charles was born in Baie St. Paul, Charlevoix, Quebec on February 21, 1897. In 1917, he came west to take a homestead near Donnelly (NW 70-78-20). However, a few months later Charles was drafted into the army. He remained in England, however, and never saw action at the front lines in France. He returned to Donnelly after the war, but after a few years Charles decided farming wasn't his line of work and he returned to his hometown in Quebec in 1924. On July 20, 1926 he married Marguerite Moquin. The couple had eight children. Charles worked for Sorel Industries until his retirement, and the company still brought him precision work until he was 75. "While employed on light railway construction, he was wounded in the right arm and left thigh by shrapnel. He was immediately taken to the nearest dressing station and from there evacuated to No. 3 Canadian Casualty Clearing Station where he succumbed to his wounds." Perry died on October 23, 1917 and was buried in the Lijssenthoek Military Cemetery in Belgium. His grave marker is inscribed with "At rest." George was born in James Bay, BC on September 25, 1893. He joined the Canadian army in 1914 and had a very eventful military career. George was awarded the Distinguished Conduct Medal in January of 1916. He was also awarded the Croix de Guerre in March, 1916 by the President of the French Republic in recognition of Distinguished Service during the Campaign. George injured his knee while trying to get a ration wagon out of a ditch. In October of 1916, he received a gunshot wound to his left shoulder. He was also gassed twice, and tried and convicted of threatening an officer. George's military service files state that he "complains of nervousness. A well nourished man - more or less vacant expression - keeps hands moving continuously - there is a rounded scar deltoid region left shoulder due to GSW (shrapnel) no disability...." George married Gladys Mary, an Englishwoman, during the war and they settled in the Bad Heart area in 1920. In 1924 he left the area and went to Mexico. He later returned to Vancouver and enlisted in the Second World War, serving seventeen months with the British Columbia Dragoons. During the Dieppe invasion with the Calgary Tanks, Knobby was wounded and discharged in March of 1944. Knobby was a notorious character in the area (check our newspaper names index for articles relating his activities and court cases). He died in 1963. John was born in Glamis, Scotland on December 12, 1878. He settled on a homestead one mile west of Lake Saskatoon and served as one of the councillors for the Bear Lake Municipality in 1915. John enlisted in the army in September of 1915. Just a few months later, on October 3, 1915, John was admitted to the hospital with a lacerated hand. He died of pneumonia on December 30, 1915. William was born in Inverwick, Scotland on April 14, 1892. He was living in Peavine, Alberta (31-58-7-W5) at the time of his enlistment in July of 1915. William received gunshot wounds to both legs at Posieres in September of 1916, and was invalided to Canada in May of 1917. William's wife's name was Hannah A. William died on May 10, 1981 and was buried in the Grande Prairie cemetery. William was born in Rexton, New Brunswick on November 25, 1895. He and his father came to the Grande Prairie district in 1911 and filed on NE 30-71-5-W5 on November 25, 1912, two miles east of the surveyed townsite. William was drafted in 1918. Cyril was born August 6, 1882 on St. Vincent’s Island in the West Indies. His father was an Anglican minister and his mother West Indian. He attended Oxford University and was a classmate of Winston Churchill. About 1910 he immigrated to Canada and when war broke out he enlisted in the Canadian Expeditionary Force. He spoke several languages and served as an interpreter in France during World War I. Cyril was awarded the Military Medal on August 16, 1917 for bravery in the field, as well as the Distinguished Conduct Medal on February 21, 1919. He received a gunshot wound to his right arm in August of 1918. After the war, Mr. Clarke took a Soldier’s Settlement Grant in the Teepee Creek area (SE 31-73-3-W6). He soon discovered that farming made his asthma much worse and began concentrating on growing vegetables and flowers instead. As a black, highly educated, lifelong bachelor, and non-farmer, he was not the norm at Teepee Creek. Cyril soon began specializing in peonies, about which he was passionate. The conservative estimate is that Mr. Clarke tested about 2000 cultivars over his thirty years of collecting. He was a regular contributor to the American Peony Society bulletin and a leading authority on peony hybrids. As he aged, Mr. Clarke began to lose his sight and his gardening friends persuaded him to move closer to Grande Prairie. They packed up his peonies and sent them to various homes. Large collections went to the Beaverlodge Research Station and the Devonian Botanic Garden near Edmonton and his records and 921 specimens were donated to the Department of Horticulture at the University of Alberta. The university grounds are still beautified with Clarke’s peonies. Mr. Clarke himself was given a home on Dr. Gurth O’Brien’s land, where he had a garden spot of good, well-cultivated soil beside O’Brien Lake. Mr. Clarke passed away at his home on December 20, 1952, at the age of 70 years. George was born around 1895. In October of 1923, near Hudson's Hope, he accidentally shot himself and died immediately. Chris was born on September 24, 1896 in Drogheda Country, Ireland. He joined the military at a young age and served with the Royal Irish Fusiliers during the Irish Revolution. After his term in the service finished, Chris came to Canada and worked in Saskatchewan. He joined the Canadian army in the First World War. In 1929, he rode the freight train to Spirit River. Chris married Vera Eleanor England on October 21, 1933 in St. Andrew's Church in Spirit River. They had twelve children. Chris also served in the Canadian army during the Second World War. Chris died on July 28, 1977. Thomas was born in Williamsburg, New Brunswick on December 28, 1890. He enlisted in the Canadian Army in April of 1915; his nephew William also served in the army during World War I. In June of 1916 while fighting at Ypres, Thomas received gunshot wounds to the right side of his neck. He received gunshot wounds to the left side of his neck and shoulder in January of 1917. Then, in September of 1918, Thomas suffered from a gunshot wound to his left foot. He was discharged on September 19, 1919. In 1920, Thomas came to the South Peace and filed on the southern half of 33-70-25-W5. His brother Martin and Martin's son William lived in the area as well. Thomas lived there for three years, but did not prove up. Thomas left the area for a number of years. He served in the Veterans Guard during World War II. In 1962, Thomas came to visit the South Peace for two days before returning to his home in Kelowna. Thomas died in Kelowna in January of 1964 and was buried in Lakeview Memorial Gardens. William was born in Brunswick, British Columbia on March 24, 1896. He was drafted in 1918. His uncle Thomas also served in the Canadian Army. According to the grave marker, William's wife's name was Lida M. William died in April 1966 at the age of 70. Ross was born in Lansdowne, Ontario, on February 8, 1897. He was drafted in June of 1918, and though he made it overseas to England, where he spent ten months, he never saw active duty at the front lines of France. Ross died in Red Deer on June 29, 1988 at the age of 91. He was survived by his wife Annie and their three children. Elzear was born in Cap-Saint-Ignace on November 22, 1892. He was wounded by a hand grenade in both legs and his right hand at Mount Sorrel on July 15, 1916, less than a month after he arrived in France. The injuries left Elzear dangerously ill, and in August his left leg was amputated five inches below the hip. Infection made a second amputation necessary in January of 1917. Three pieces of shrapnel remained in his right knee for quite some time. Elzear was sent back to Canada in March of 1917 aboard the HMHS Essequibo, the first hospital ship to cross the Atlantic to Canada. He was discharged in September 1918. His brothers Irene and Omer also served in the war. Elzear returned to his homestead at SE 32-76-21, where he lived with his wife Marguerite and their six children. Elzear died on February 17, 1959. Irene was born on December 18, 1895 in St. Marie, Quebec. He was drafted in June of 1918 and discharged two months later for unknown reasons. His brothers Elzear and Omer also served in the war. Irene homesteaded at 36-76-22-W5 and never married. He retired to High Prairie in 1960, and died in a nursing home in St. Alberta in 1969. Branch: No. 10 Engineers & Railway Contingent R.D. Omer was born in Quebec on July 24, 1888. He was the elder brother of Elzear and Irene Cloutier. He came to the Peace Country in 1913 and filed on NW 5-76-21-W5 and SW 31-76-22-W5. Omer had previously enlisted in the 66th Battalion in 1915 but was discharged because he had flat feet. Later he enlisted in the No. 10 Engineers & Railway Contingent R.D. and served in Canada. Omer was discharged in January 1919 as he was declared medically unfit. He never married. Omer died of a severe head injury late in 1944, having been in a horse-drawn cutter when it overturned on ice. Frank was born on March 10, 1896 in Cambus, Clackmannanshire, Scotland. In April 1915 he filed on a homestead at SE-28-71-8-W6. His brothers Percy and Tom had adjoining homesteads. Frank enlisted in December of 1915 and was wounded several times during his military service in France: a shrapnel wound in the face in April 1917, a gunshot wound to his left arm in August 1917, and gunshot wounds to his right thigh and right arm in October of 1917. Frederick was born Tullow, County Carlow, Ireland on April 6, 1890. At the time of his enlistment in January of 1916, he was living in Acme, Alberta. Frederick was sent to France on April 15, just missing the Battle of Vimy Ridge by three days. On June 3, 1917, he received shrapnel wounds to his left elbow. After being discharged, Frederick came to the South Peace and filed on land at SW 10-73-10-W6 and the western half of 14-73-10-W6. Frederick died on October 18, 1974 and was buried in the Hythe Cemetery. Donald was born in Pembroke, Ontario on July 4, 1893. He enlisted in May of 1916. Donald was killed by enemy shellfire on Hill 70 on August 15, 1917, just after "jumping off in No Man's Land." He was buried in Maroc British Cemetery, which is located 3.5 miles northwest of Lens, France. Alfred was born in London, England on November 24, 1881. He came to Canada before the war. After arriving in Montreal, he took the train to Edmonton and then walked to Spirit River. Alfred enlisted in the Canadian army in July 1916. During the war, he married Winnifred Emily Hian, an Englishwoman. Alfred brought his wife and their young daughter back to Spirit River after the war. Sherm was born in Darlingford, Manitoba on July 14, 1895. He joined up in March of 1916. Because of his familiarity with horses Sherm was given the task of driving ammunition wagons. He also manned listening posts in No Man's Land. Sherm married Verna Keown in Morden, Manitoba in 1925. In the late 1920s the family moved to the Spirit River area. Sherm died in April of 1973. Christian was born in South Kensington, London, England on January 13, 1892. At the time of his enlistment in January of 1915, Christian, his wife Minnie, and daughter Gladys were living in Edmonton. He was discharged on January 31, 1916 because of deafness, but reenlisted on February 4, 1916. Christian was once again discharged on October 12, 1917. In 1919, Christian filed on the northern half of 21-78-20-W5. Clarence was born in Pakenham, Ontario on August 20, 1894. He homesteaded at 17-72-3-W6. In March of 1916, Clarence enlisted in the Canadian army. His father Henry and brother Percy enlisted as well. Clarence received a shrapnel wound in the left arm in May of 1917. He died on February 20, 1956. Henry was born in Pakenham, Ontario on May 11, 1868. He homesteaded at SW 28-72-3-W6. Henry was married to Susan and they had four sons, two of whom - Clarence and Percy - also joined the Canadian army during the First World War. He served in England for two years and ten months but never saw active duty at the front lines in France. Percy was born in Cedar Hill, Ontario on September 1, 1900. He lied about his age to get into the army and serve as a bugler, but two months after he got to France (July 1917) his lie was discovered. Percy was discharged and sent home. His father Henry and brother Clarence also served in the war. Jim came up from Saskatchewan to the LaGlace area, where he owned and operated a tannery in the 1930s and 1940s. In 1945, he homesteaded in the Northmark area, S.E. 30-76-7-6. Jim died in June of 1973. Harlie was born in Maplewood, Nova Scotia on November 14, 1890. He came to the Clairmont area in 1912 and filed on SW 10-73-6. In 1914, Harlie and several other men from the area joined the RNWMP. After his training, Harlie was stationed at Hardisty, Alberta where he met and married Florence Ruth Davis. He enlisted in the Canadian army in September of 1916. After the war, Harlie and Florence moved back to the homestead, where they lived until 1927. They had six children. Harlie died on February 11, 1970. Booth was born in Carleton, Ontario on June 9, 1891. He enlisted in the Canadian army in 1915 and was sent overseas. His brother Gordon joined up as well. Booth fought at Vimy Ridge, and was in every advance in which the Canadians participated. He was wounded in April of 1917. Booth married an Englishwoman named Alice during the war. He was at Mons when the Armistice was signed. In the months between the end of the war and being sent home, Booth was posted to police duty in the Canadian Military Police Corps. In 1928 he came to Beaverlodge to homestead. He spent four years with the RCAF Service Police during the Second World War. Booth married Mabel Sims in 1954 (there is no record of what happened to his first wife, Alice). He died in Grande Prairie in May of 1980. Gilbert was born in Gloucestershire, England on June 14, 1895. He came to Canada and settled in Saskatchewan before the war, and enlisted in the Canadian army in 1915. In July of 1916, Gilbert slipped and fell doing trench work, which caused a hernia for which he required surgery. He was discharged in February of 1917 due to phlebitis, and convalesced in Winnipeg. Gilbert was drafted again in 1918. In the time between his discharge and reenlistment, Gilbert married a woman named Winnifred. After the war he homesteaded at 24-72-4-6, 18-77-6-6, 19-77-6-6, and 20-77-6-6. Gilbert died in Grande Prairie in December of 1986. Gordon was born in Alfred Village, Ontario on February 6, 1896. He and his brother Booth both served in the Canadian army during the First World War. After the war he married Annie Pyrke, who had lost her husband in France in 1916. They farmed in Saskatchewan until 1928, at which time they came to the Beaverlodge area. Gordon died on August 3, 1972 and is buried in the Albright Cemetery. Ted was born in Surrey, England on April 1, 1898. He came to Canada just one month after the sinking of the Titanic. Ted enlisted in 1918 and was detailed to look after mules in Belgium for one year after the end of the war. He married in 1920, and in 1928 he and his wife settled in Hythe. Ted died in Hythe in August of 1970. Fred was born in Drysland, Ontario on December 16, 1884. He enlisted in the Canadian army in September of 1915. Fred died on January 20, 1954. Arthur was born in Rock Island, Quebec on November 17, 1889 and came to the Peace Country in 1911. In March of 1916, he enlisted in the Canadian army. In May of 1917 Arthur received a gunshot wound to his neck and his left jaw was fractured. He was seriously ill as a result, and remained in England for the duration of the war. Arthur died on January 29, 1950. Thomas was born on the Isle of Man on December 16, 1891. In 1911 he emigrated to Canada. He was living in Woodstock, Ontario at the time of his enlistment in April of 1916. In 1920, Thomas filed on the southern half of 10-72-2-W6. Later, in 1928, he filed on the eastern half of 12-72-12-W6 and NE 27-72-3-W6. Thomas married Elizabeth Tenge in October of 1940. Thomas died in Hythe in 1970. Clarence was born in Leamington Hastings, England on April 30, 1876. He filed on NW 28-73-3-6, in the Tranquility area, on June 10, 1913. In March of 1915, Clarence enlisted in the Canadian army. During an exercise ride on September 20, 1916 at Bussy les Daours (Somme), he was kicked by a horse and suffered from a sprained ankle. After recovery, he was given light duty in the stable and cook house. Clarence's wife's name was Catherine. He died on August 8, 1955. James was born in Brantford, Ontario on October 29, 1871. He came to the Peace River country in 1902, and served as MLA for the district from 1909 until 1913 and was a great promoter of development in the region. James married Evelyn Tierney in Calgary in 1908. Prior to serving in the Canadian army during World War I, James served in South America. He was awarded the Distinguished Service Order by George V in January of 1918, and also received the Croix de Guerre from the French government in November of 1918. James’s homesteads were located at 10-71-1-W5, 7-80-4-W6, and 14-73-6-W5. He died in Edmonton on November 20, 1955 and was buried in the Field of Honour in the Burnsland Cemetery. Walter was born in Emshott, England on March 25, 1883. He was living in Regina, Saskatchewan at the time of his enlistment in March of 1917. In 1920, Walter filed on NE 33-77-26-W5 and SW 4-78-26-W5. He canceled both homesteads, but his present address card (dated in the 1920s) said Grizzly Bear. John was born in Ottawa, Ontario on April 11, 1879. He enlisted on August 7, 1916 but a week later was admitted to a hospital in Edmonton due to a "septic hand" and his left ring finger was amputated. He was consequently discharged in January of 1917. 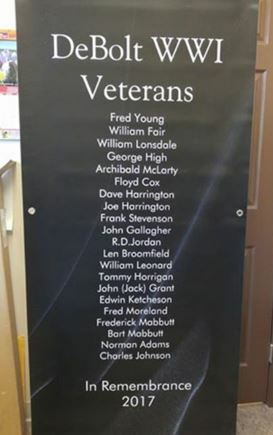 *Please note that the service file contains documents for John Joseph Costello #506164, who was born in Ottawa and enlisted in Grande Prairie, as well as John Joseph Costello #2323622, who was born in Victoria and enlisted in Merritt, BC. Alphonse was born in Notre Dame de Levis, Quebec on February 18, 1890. He came west with his parents in 1909, and settled in Donnelly in 1916. Alphonse opened the first store and post office in Donnelly in 1917. In January of 1918, he was drafted. His brother Zoel was drafted as well. Alphonse married Aurore Allard in 1920 and the couple had five children. Aurore died in 1927, and two years later Alphonse married Eva Dansereau. He died in an Edmonton hospital in August of 1934. Zoel was born on September 9, 1897 in Danville, Quebec. He came west with his parents in 1909 and settled in Donnelly in 1916 (SE 1-78-21-W5). Zoel and his brother Alphonse were drafted in 1918. He trained at Camp Bramshott in England in 1918 and was discharged in 1919. Zoel returned to Donnelly after the war. On March 3, 1924, Zoel married Marie Dentinger and the couple had seven children. Alfred was born in Washburn, Wisconsin on October 18, 1896. He and his father were living in L'Amoureux, Alberta when he was drafted in June of 1918. Alfred served only in England. In 1928, he filed on a homestead at SW 25-79-22-W5. Alfred was married to Leonida M. Blouin. Alfred died on February 12, 1979 and was buried in the Jean Côté Sacred Heart Cemetery. William was born in Thornhill, Manitoba on June 4, 1891. He came to the South Peace in 1911 and filed on homesteads at 16-78-20-W5 (? ), 28-90-23-W5, 30-90-23-W5, and 19-90-23-W5. In May of 1916, William enlisted in the Canadian army. He suffered from pleurisy in June of 1917, was gassed in November of 1917, and had cordite poisoning (possibly from the lead in ammunition) in November of 1918. William died on March 6, 1968. Joseph was born in Liverpool, England on April 16, 1881. In 1914, he filed on a homestead SW 33-77-20-W5. Joseph enlisted in the Canadian Army at Grouard in January of 1915. Alfred was born on May 30, 1882 in London, England. He filed on a homestead at 23-76-3-W6. When he enlisted on July 7, 1916, Alfred wrote in his will that he bequeathed all his real estate to "some wounded returned soldier, who wishes to file on a homestead." Towards the end of the war, he suffered severely from flat feet. Alfred died at the Provincial Mental Institute in Edmonton on August 26, 1963. Floyd was born in Rapid City, South Dakota on January 25, 1898. He enlisted in Edmonton on June 15, 1916. Floyd received a gunshot wound to his right thigh at Ypres (Passchendaele) in November of 1917. After the war he settled at NE23 and SW24-72-1-W6, where he built a three room frame house, quite possibly the first lumber house built in the area. However, though he spent part of the winter of 1919-1920 on his homestead, Floyd never returned after 1920 and the land reverted to the soldier's settlement board. Jack served in the army in the old country before filing on a homestead in the Sexsmith district in 1929. He was said to be a great moonshiner and kept an oak barrel under a comforter next to his bed. If unexpected visitors showed up, he would be seen very busily working on his quilt. He eventually sold his land to Joe Zan. 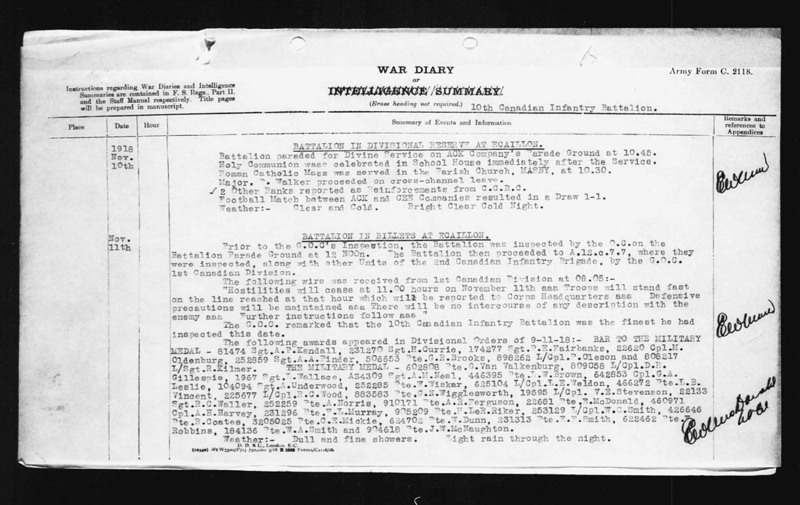 "On June 13th 1916 while proceeding into communication trench on Hill 60, shell burst in trench and patient received wounds on scalp, neck, right shoulder, right forearm, and right foot. Was taken to dressing station at Zillebeke where he was dressed. Then to Casualty Clearing Station at Poperinghe, then to 13th Stationary Hospital at Boulogne where shrapnel was removed in one operation. Was there 3 days, then moved to Duchess of Connaught's Canadian Red Cross Hospital, Taplow"
"On Dec. 23 1918 while on duty was hit under the right eye with end of stick, causing contusion of soft parts of cheek and contusion of eye. Eye swelled up and since then vision in right eye has been poor." George was born in County Donegal, Ireland on May 2, 1891. It is unknown when he first came to Canada, but he enlisted in the Canadian Army in Belleville, Ontario 1915. In December of 1916, George was attached to the RFC (RAF) as Observer. On July 2, 1918, he was in an airplane accident at Grantham. At the time of this accident, he'd had six hours and 25 minutes of dual flying experience, and seven hours solo. He was a pupil at the time. Pages 27 to 36 of George's service file contain notes from the resulting court case, including witness testimonies. In 1919, he came to the South Peace and filed on SW 7-73-11-W6 and SE 12-73-12-W6. He was part owner of a 700 acre ranch from 1919 to 1922 at which point he "gave up the struggle." George operated a trading outfit on the Mackenzie River from 1925 to 1927. After this experience, he spent a year in Ireland. At some point after his return, George married Anne Robinson. They had one son. George wanted to serve in the Canadian Army during World War II, but was rejected because of his age. George and Anne lived in Edmonton for some years, where George was a supervisor for the Northern Transportation Company. He later became the manager of the Calgary Municipal Airport. George died on February 29, 1968. Sidney was born in Harrow, Middlesex, England on December 12, 1889. He filed on a homestead at NE 3-73-6-W6, which he left behind to enlist in the Canadian army on July 17, 1915. Sidney was killed in action at Courcelette on October 8, 1916 and was buried in the Regina Trench Cemetery (grave reference II.G.4). His brother Stanley was killed in the same battle a few days later. Stanley was born in London, England on March 25, 1894. He filed on a homestead at SE 10-73-6-W6, but left it behind to enlist in the Canadian army on August 3, 1915. Stanley was killed in action at Courcelette on October 13, 1916. He was buried in the Courcelette British Cemetery (grave reference X. E. 7.). His brother Sidney had been killed in the same battle a few days earlier. Rudy was born on June 8, 1897 in Emerald, Prince Edward Island. In 1916 his made his first trip into the Peace Country, bringing cattle and machinery up to Bezanson, where he and his brother Patrick hoped to farm. He was drafted in June of 1918. After the war, Rudy returned to work as a U.G.G. grain elevator agent in Clairmont. He married Jennie Tomshak in June of 1937. Rudy and Jennie lived in Clairmont for eighteen years before moving to Grande Prairie in 1954. Rudy died in 1961 and was buried in the Grande Prairie Cemetery. Walter was born on June 12, 1879 in Rutherglen, Lanarkshire, Scotland. At the time of his enlistment, Walter was living in Port Clements, BC with his wife Agnes Coates (Warner) Cross. After the war, the couple filed on a homestead at 18-73-11-W6. Walter died in Victoria on May 4, 1966. John was born in Calton, Glasgow, Scotland on March 30, 1874. At the time of his enlistment in February of 1917, he and his wife Mary Jane and three children were living in Braeside, Ontario. John served only in Canada and England. After the war, he filed on the northern half of 25-70-26-W5. John died on December 28, 1960 and was buried in the Grande Prairie Cemetery. Reginald was born on October 18, 1891 in Worcester, England. He filed on a homestead at 15-71-2-W6, near Bezanson, where he was living at the time of his enlistment in 1916. Philip was born in Kansas City on April 26, 1872. He and his wife Jennie came to the South Peace in 1917 and settled on 36-73-10-W6. The couple also had a son Thomas, who was five months old when Philip enlisted in December of 1915. In April of 1918, Philip was discharged, having been found medically unfit (the primary reason was myalgia in his legs). The Cunninghams settled in Valhalla in 1919. Edgar was born in England around 1891. He served in the Royal Field Artillery during World War I. Edgar died on October 14, 1966 at the age of 75 and was buried in the Hythe Cemetery. Hardie was born in Neepawa, Manitoba on February 8, 1892. He settled in Spirit River, where he was living when the war began. Hardie enlisted in March of 1916, and sustained gunshot wounds to his back and left thigh in August of 1918 at Cambrai. He was also awarded the Military Medal in November of 1918. Reginald was born on September 9, 1889 in Caledonia, Nova Scotia. He enlisted in the Canadian army on December 7, 1915 and served with the Canadian Army Service Corps in France. After the war, Reginald filed on homesteads at 31-70-24-W5 and 9-71-24-W5. John was born on July 15, 1887 in Webster, Massachusetts. At the time of his enlistment in July of 1915, he was living at Peace River Crossing (3-83-25-W5). John suffered from trench mouth in 1916, and in August of that year he strained his leg in a tug of war. This may have contributed to the phlebitis that caused John to be declared medically unfit and discharged in late 1918 or early 1919. He was awarded the Meritorious Service Medal in 1917 or 1918 for valuable services rendered in the field. John married Catherine Dorothy in 1918. He died on January 9, 1972. Ernest was born on December 15, 1882 in Hove, Sussex, England. He enlisted in Edmonton in July of 1915. According to his medical records, he had lost the second toe on both his feet (evidently due to hammer toes). During his time overseas, Ernest married a Frenchwoman named Argentine from Bruay, Pas-de-Calais, France. After the war, Ernest and Argentine settled in the Hythe district (25-73-11-W6 and 13-7-6-W6). Ernest died on June 22, 1948. Frank was born in Beaford, England on June 27, 1887. It is unknown when he came to Canada, but he enlisted in Calgary in September of 1915. In February of 1917, Frank suffered from slight gunshot wounds to his chest. He received shrapnel wounds from a high explosive shell on November 1, 1918; this resulted in a fractured skull, defective vision in his right eye, and headaches. Frank was operated on on November 2, 1918; a piece of shrapnel and two small pieces of bone were removed (a skull x-ray is available on page 61 of Frank's service file). He was awarded the Military Medal in August of 1919. In 1919, Frank filed on a homestead at SW 20-78-20-W5. John was born to William and Sarah Darragh on May 14, 1894 in Campbellford, Ontario. 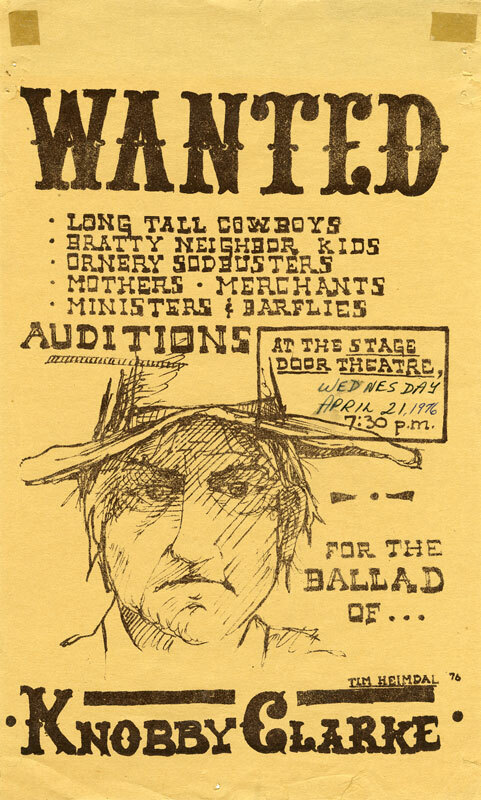 He came west and filed on a homestead at 27-73-5-W6. John enlisted in the Canadian army in July of 1915. Just three months after he arrived in France, on September 15, 1916, John was wounded in the advance from Pozieres to Courcelette during the Somme offensive. He died of gunshot wounds to the abdomen in the Special Hospital at Warloy-Baillon the same day. John's graver marker is inscribed with "Our son and brother all his sorrows left behind and earth exchanged for heaven." Joseph was born in Granby, Quebec on March 19, 1896. It is unknown when he first came to the South Peace. Joseph enlisted in the Canadian Army in Wainwright in January of 1916. On July 16, 1918 at 2:40pm, Joseph was accidentally shot in the back by a man from his battalion. Pages 17, 21, 23, and 27 of Joseph's service file contain notes from the resulting court case, including testimonies of the witnesses and the man who shot him. His medical records also note that in November of 1918, Joseph had a tumor on his lower lip. As a veteran of World War I, Joseph served with the Eaglesham & District Veterans Volunteer Reserve during World War II. George was born in Vancouver on August 27, 1894. He came over the Edson Trail in 1912 and filed on a homestead at 15-71-10-W6. Shortly after he arrived, Harry Adair had him bring in a sawmill outfit. In 1915, George enlisted in the Canadian army and shipped overseas. He was an excellent shot with a rifle and was always selected to represent the 66th Battalion in rifle competitions. George died of pneumonia at Moore Barracks Hospital, Shorncliffe on May 23, 1916. Honore was born in West Flanders, Belgium on January 8, 1886. He filed on a homestead at 18-72-10-W6, in the Beaverlodge area, before the war while his wife Delphine and daughter Maree stayed behind in Ruddervoorde, Belgium. Before Honore could bring his family to join him, war broke out and he enlisted in the Canadian army on May 15, 1916. He had previously served in the Belgian army. Pierre was born in Charente, France on November 9, 1885. At the time of his enlistment on July 3, 1916, he was living in Grande Prairie. Jack was born on April 25, 1889 in North Bay, Ontario. He came to the South Peace in 1911 and filed on homesteads at 11-72-6-W6 and 10-72-6-W6. Jack set up a jewelry store in Grande Prairie in 1911/1912. On September 15, 1914, Jack enlisted in the Canadian army. While serving overseas, he met Violet Mary Beer. They were married in Salisbury, Wiltshire, England in November of 1915. Jack and Violet had a son, John Richard, who was born in England on February 28, 1917. Euclide was born in Ramsayville, Ontario on November 8, 1889. He filed on a homestead at 20-70-11-W6, near Halcourt. In May of 1918, Euclide was drafted. He arrived in Siberia in January of 1919, and was sent back to Canada in July of the same year. Joseph was born in Meerbeke, Belgium on March 14, 1874. He served for four years in the Belgian Cavalry. It is unknown when Joseph came to Canada, but he was living in Forget, Saskatchewan at the time of his enlistment in January of 1917. In 1928, he filed on the eastern half of 14-78-23-W5. Joseph died on July 20, 1944. Emile was born in Ste. Camille, Wolfe County, Quebec on February 3, 1888. He enlisted in Vernon, BC on June 18, 1915, and had previously served with the 11th Regiment, Irish Fusiliers of Canada. While serving overseas, Emile sustained a shrapnel wound to his left arm in June of 1916, and a gunshot wound to his right thigh and buttocks. On September 2, 1918, Emile was awarded the Distinguished Conduct Medal "For conspicuous gallantry and devotion to duty on the 2nd September, 1918, in the second battle of Arras. During the fighting he with his section engaged large numbers of the enemy on three occasions as they emerged from dug-outs, bombing the occupants and taking the survivors prisoners. He was slightly wounded when steadying his men under enfilade fire." Emile filed on a homestead at 35-76-21-W5. He died in Vancouver on December 12, 1955. Ernest was born in Meriden, Connecticut on March 28, 1893. He settled in Girouxville (35-77-22-W5) and owned a store in Falher for twenty years. Ernest married Francoise LaPalme in 1924; the couple had nine children. Ernest died on October 17, 1980. Philippe was born on November 1, 1891 in St. Anne de la Perade, Quebec. He moved to Donnelly in 1917 and homesteaded at SW 7-77-20-5. In 1918, Philippe was drafted but as the war was nearly over, he didn't make it to England before his discharge in January of 1919. In December of 1919, Philippe married Marthe Perrier. The couple had seven children. Philippe left in 1930 to work on the railroad at Reno, and the rest of the family joined him later. They eventually moved to Lacombe, where Philippe died in September of 1961. Alexander was born in Inverness, Scotland on December 18, 1887. When he was drafted in spring of 1918, Alexander was living in Beaverlodge. His brothers Murdo and John were already serving overseas at this time. Alexander didn't reach France until October 1918, near the end of the war. He died in January of 1966 in Edmonton. Sources: Pioneers of the Peace, p. 297. John was born in Beauly, Scotland on January 6, 1885. He immigrated to Manitoba in 1909, but heard of higher wages on sheep ranches in Montana and Oregon and worked there for a time. His brothers Alex and Murdo joined him. In 1914 John came to the Beaverlodge area (NW5-72-10-W6) over the Edson Trail. On August 31, 1914, he married Isabella Mackintosh in Edmonton; the couple had five children. John enlisted in the Canadian army in July of 1916 and returned to his farm and family after the war. John died in Beaverlodge in September of 1966. He had gone missing on September 1 and was found dead the next morning. Murdo was born in Inverness, Scotland on August 29, 1891. He worked on sheep ranches in Montana and Oregon with his brothers Alex and John for a time, and moved on to ranches in Argentina for about a year. He came back to Montana in 1916 and came up to join his brother John in Beaverlodge. He enlisted in the Canadian army in December of 1916. He served in France and received a gunshot wound to the scalp on September 28, 1918. After being discharged in February of 1919, Murdo returned to Beaverlodge and filed on SE 12-72-11-W6. He farmed this land until 1940, when he sold out and worked for the US Army in Dawson Creek. When he returned to Beaverlodge after the war, Murdo bought SE 7-72-10-W6 and lived there until 1958. At this point he moved to Vernon, BC for a few years. Murdo decided to return to Scotland for a time, but found that he preferred Canada after all. 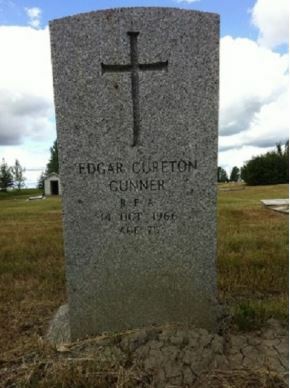 He died in Beaverlodge in 1966 and was buried in the Beaverlodge cemetery. Charles "Ray" Dillon was born in Fertile, Minnesota on December 2, 1891. 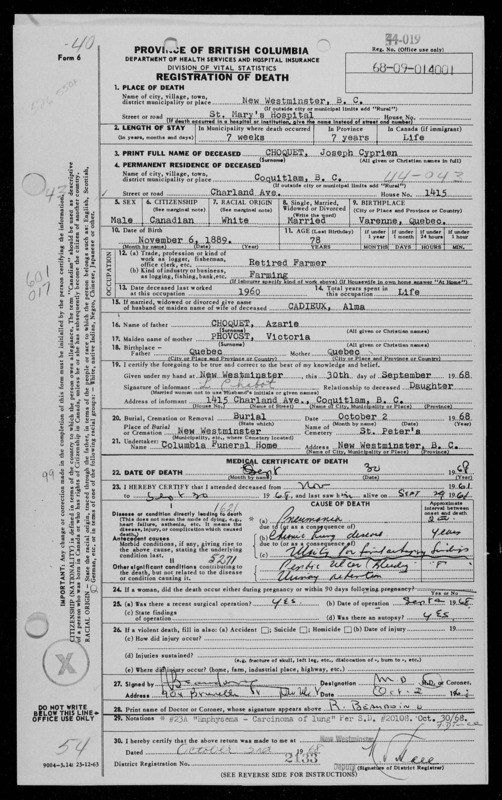 He came with his family to the Peace Country in 1911 and filed on homesteads at 2-71-7-W6, 4-71-7-W6, and 4-71-6-W6. Ray was drafted in April of 1918 but only got as far as Petawawa, Ontario when the Armistice was signed. He had a severe case of the flu in 1921, which limited the use of his right arm for the rest of his life. In 1944, Ray contracted the flu again and died on January 16, 1944 in the Grande Prairie hospital. Henry was born in Port Hope, Ontario on February 8, 1876. When he enlisted in the Canadian Army in 1916, he, his wife Ella Mable, and their six children were living in Fishburn, Alberta. Henry was injured by bombs at Vimy Ridge on April 9, 1917. He had cuts on his left hand, left hip, and left foot. In June of 1917, Henry was awarded the Military Cross for gallantry and devotion to duty in the field. He was discharged on November 7, 1919. After being discharged, Henry filed on NW 31-78-19-W5 and SE 31-78-19-W5. Henry worked as an engineer, and took part in the survey for the Edmonton, Dunvegan, & British Columbia Railway extension in the early 1920s. He also ran as the Conservative candidate for the Grouard constituency in 1926. The community of Dimsdale was named after Henry. Henry died in Victoria on October 23, 1963. Ernest was born in Parrsboro, Nova Scotia on June 10, 1895. His brother James filed on a homestead for him by proxy on May 17, 1915, in the Beaverlodge area (NE10-71-10-W6). Ernest arrived in fall of the year. He was drafted in 1918, but returned to his homestead after being discharged. Ernest never married and died in the Hythe Pioneer Lodge in March of 1974. Hugh was born in Listowel, Ontario on December 5, 1885. He came to the Peace country in 1911 and filed on NE 3-73-8-W6. Hugh walked to Edmonton and enlisted in the Canadian army in 1915. Hugh received gunshot wounds to his left thigh and ankle on September 8, 1916 at the Somme, near Albert, and was on the "seriously ill" list for about a month afterward. This was only about two months after arriving in France. Medical records read that "He states - he was wounded by shrapnel Sept. 8 , 1916 on the Somme. One piece passed through muscles of the flexor surface of left femur in the middle third, causing a very deep flesh wound about 8 inch long. Another piece of shrapnel struck the (?) of left foot about 1 inch below the ankle joint on the inner side. This was removed in Boulogne Hospital, France, and he was told the foot was fractured. Opening was made on the outer side and bones scraped." Hugh was operated on at Albert within sixteen hours, then again at Boulogne, then sent to a hospital in England. He sailed to Canada March 1917 and was sent to convalescent home in Edmonton. Hugh's ankle did not heal well and his foot was "held in position of obtuse angle 105 degrees with axis of leg; movement in ankle joint is so slight as to be almost negligible" and he walked with "a decidedly awkward gait," using a cane. Arthur was born in Waltham, Leicestershire, England on February 24, 1890. He enlisted in the Canadian army in November of 1915; he had previously served as a constable in the RNWMP. Arthur received a gunshot wound to his left knee on September 15, 1916. This probably happened at the Somme, since he served in the same battalion as Hugh Dool, who was injured there around the same time and both were hospitalized at Boulogne. Arthur was also gassed in August of 1918 though he was not ill as a result. However, his eyes did water while reading after being gassed. Arthur's wife's name was Edith Mary, though she went by May. Arthur died on September 4, 1973 at White Rock, BC and was buried at Victory Memorial Park in Surrey. Harry was born in Madoc, Ontario on July 22, 1876. He enlisted in December of 1916, though it is uncertain whether he served overseas or remained in Canada. Harry's medical records note that he fractured a finger in February 1917 while he was still stationed in Toronto. Albert was born in Quebec City, Quebec on November 25, 1895. He enlisted in the Canadian Army in November of 1916. In November of 1917 at Passchendaele, Albert began suffering from myalgia as a result of the conditions in the trenches. In 1930, he filed on SE 4-79-24-W5. Albert died on May 11, 1961. Thomas was born in Dreghorn, Ayrshire, Scotland on May 28, 1864 (though he lied about his age on his attestation paper and wrote 1872). He homesteaded at NE 26-72-7-W6 in 1914 but also worked as a veterinarian. His wife's name was Isabella McLaughlin Duff, and they had a daughter Lucy, who was fourteen when Thomas enlisted in August of 1916. On October 19, 1916 he was declared medically unfit and discharged. Thomas admitted to being 52, not 44 as indicated by his attestation paper. Henry was born in New Richmond, Quebec on March 7, 1894. He came west to Edmonton in 1912, and settled in the Bezanson area in 1915. Henry did some boxing as a light heavyweight in his youth and also while he was in the army. He enlisted in July of 1915. In February of 1918, Henry was struck on the nose by a splinter falling off a building; it lacerated the bridge of his nose and fractured nasal bones. Henry survived the war and returned to Bezanson in 1919; at this time he filed on 21-72-3-W6. In 1949 he sold his farm and worked for a lumber company in Fort St. John. Henry returned to Grande Prairie in 1964 to retire and died in April of 1982. He was buried in the Grande Prairie Cemetery. Alexander was born in Dunfermline, Scotland on May 5, 1897. He homesteaded at NE36-74-8-W6. Alexander was drafted in the summer of 1918, but was discharged within a month. George was born in Lossiemouth, Scotland on October 7, 1892. In 1916, Charles Kitchen and George bought the Grande Prairie Herald. They continued as owners until 1927 when Charles Kitchen sold his half to Charles W. Frederick; George sold his half to Charles Frederick in 1930. George enlisted in the Canadian army in April of 1918, near the end of the war. He made it to England, but never saw action in the front lines of France. Frank was born in Tacoma, Washington on August 5, 1884. At the time of his enlistment in February of 1917, he was living in Chilliwack, BC. Frank homesteaded at 18-70-10-W6 and 13-70-11-W6. Lawrence was born in Fort Alexander, Manitoba on November 20, 1896. He enlisted in the Canadian army in October of 1915. Lawrence's address in 1922 was in Goodfare. Lawrence's father, Omer, and younger brother, Wilbrod, joined up in autumn of 1915 as well. Omer was born in St. Antonius (? ), Quebec on March 30, 1861. When the war began, he was living in Manitoba, a widower with four sons and a daughter (his wife had died on March 15, 1910). Omer enlisted in the Canadian army in September of 1915, though he lied about his age, stating that he was born in 1871. His sons Wilbrod and Lawrence joined up as well. Omer only served in England, as the cold damp tents at the front did not agree with him, and was discharged on April 1, 1918 for being medically unfit - he suffered from myalgia and rheumatism and, of course, was overage. While serving in England, Omer was remarried to an Englishwoman, Constance Caroline Edwards, on July 11, 1917. He returned to Manitoba after the war, then headed west to the Peace country with his wife and daughter. Omer filed on a homestead at 9-72-12-W6. In 1928 they returned to Manitoba. Omer died in 1944. Wilbrod was born in Fort Alexander, Manitoba on January 19, 1898. In order to enlist in the Canadian army in the fall of 1915, together with his father, Omer, and brother, Lawrence, Wilbrod lied about his age and said he was born in 1897. He received a slight gunshot wound in the back in September of 1916, and suffered from a foot infection in January of 1917. Wilbrod was part of the Army of Occupation in Germany for a few months after the end of the war. After being discharged in 1919, he traveled to Grande Prairie to join his father. In January of 1928, Wilbrod married Mary Wills, whom he had met in England in 1916. Mary and her family were friends of Constance Edwards, Wilbrod's stepmother, and they had come to the Grande Prairie area in 1926. Wilbrod died in March of 1973. Edouard was born in St. Lazare, Manitoba on February 28, 1896. The family moved to Goodeve, Saskatchewan when Edouard was a child, and in 1918 he was drafted into the army. He was stationed in Regina and Moose Jaw, but was discharged before going overseas because he was his parents' only child. Upon returning to Goodeve, he married Martha McDougall. She died when their son Leonard was 9 months old. He then met Lilian Rickard; they were married on April 22, 1925. In 1928 the couple moved to Guy. They had nine children. Edouard died on January 25, 1986 in High Prairie. George was born in Marennes, France on September 6, 1883. He and his wife Emma (Thomas) and their four children immigrated to Canada in 1913; their destination was St. Albert, Alberta. Two more children were born after the family arrived in Canada. George enlisted in the Canadian army in February of 1916 (he had previously served with the French Infantry). According to his medical records, he required surgery for his varicose veins. George was discharged on July 30, 1918 to reenlist in the French Army (6th Battalion Infantry, #875). He returned to St. Albert after the end of the war, and in 1920 the family moved to file on a homestead in Bezanson (3-73-3-W6). George died in 1970. Philias was born on June 17, 1888 in Wotton, Wolfe County, Quebec. In 1913, there was an explosion in the mine where he was working in Fernie, BC. Philias's skull was fractured and he suffered from headaches as a result; the headaches worsened after his enlistment in the army. Philias was wounded at Vimy Ridge in January of 1917; he fractured the middle finger of his right hand and there was shrapnel in his right elbow and left leg. He was also struck in the head and was unconscious for four hours after being wounded and had two fits on the way to England. Philias was sent to a convalescent home in Edmonton, and discharged on November 30, 1917. Numerous disabilities were listed on his discharge paper: loss of function in his right hand, dizziness, pains in his head, poor memory, fits, nervousness, and weakness in his left leg. In the board's opinion, Philias was mentally deficient. After discharge, in 1918, he settled in the Elmworth area (3-70-11-W6) with his Irish wife. Philias died on February 26, 1962 at the Shaughnessy Hospital, Vancouver. John was born in Leadville, Colorado on January 3, 1889. At the time of his enlistment on August 7, 1916, he was living in Spirit River (35-77-5-W6). John died on November 23, 1944. Note: the two links below may be the records for Daniel J. Dyer, who filed on SE 5-78-26-W5 in 1919 through the Soldiers Settlement Board. Thus far, it has not been possible to confirm his identity.